Kane has been linked with Barca, who are reportedly seeking a long-term successor for Luis Suarez, despite signing a six-year contract before the World Cup, where he won the Golden Boot in England's run to the semi-finals. Barca head coach Ernesto Valverde described Kane as "exceptional" ahead of Tuesday's Champions League meeting between the clubs at Camp Nou. 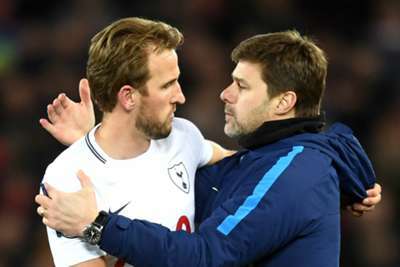 Kane has shown little public interest in leaving Spurs but Pochettino noted Premier League stars including Philippe Coutinho and Cristiano Ronaldo have previously been tempted to Spain. "We have seen that many teams, both in LaLiga and the Premier League, have the economic capacity to steal a star from an important team," Pochettino told a news conference. "It has happened in the past. Real Madrid signed Cristiano from Manchester United, Coutinho was taken off Liverpool. It has happened in different ways and it will happen in the future, I'm sure. "But that does not only depend on the economic side, it also depends on the player's aspirations, sometimes they make decisions on facts, certain decisions force players to make decisions at times." Spurs have also been linked with a move for Barca's rising star Riqui Puig, but Pochettino was unwilling to reveal if the 19-year-old midfielder is a target. "I don't like to talk about rumours," he said. "Puig, I don't talk about youth players, there is no benefit, it's customary not to talk about these things." Valverde told his pre-match news conference Suarez would not play, the former Liverpool striker having made a goalscoring return from a knee injury in a 4-0 LaLiga derby win at Espanyol on Saturday. Suarez was later named in Barca's squad, along with other stars including Lionel Messi, although Valverde indicated he could take the chance to rest players with top spot in Group B already guaranteed. "We play against Barcelona - I'm not focused on the starting 11," continued Pochettino, whose side must at least match Inter's result against PSV to advance. "When you play for Barcelona there is always pressure to win - you play for something special. It's the same when you player for Tottenham, the names are not important. "When you play Barcelona, the quality they have in the squad is amazing, different names have different qualities to add to the team, but they will be strong, they will try to beat us and for different reasons they will play for each other - it's not my business. "For us, it should be the same motivation, approach, thinking to deliver our best job and try to win, that's how we need to approach the game." Of Suarez's absence, he added: "Obviously it's an important miss for Barcelona. He's one of the best strikers in the world, together with Harry Kane. It's a shame he won't be playing. "Suarez has proven in different countries, especially with Liverpool in England and at Barcelona, that he's one of the best strikers nowadays. Obviously, it is important - Barcelona are going to miss him."